La Palmera Family Mexican Restaurant really is all about family. With two locations – in Everett and Mill Creek – and one soon to open in Seattle, it is also a classic American success story. Owner Hector Mendoza grew up in a small town in the Mexican state of Jalisco. “I’ve been in this industry since I first came to the U.S. in 1985,” Mendoza said. Mendoza immediately settled in Seattle after emigrating and soon found a job in a restaurant near Seattle Center. He started as a dishwasher and worked his way up the ranks, becoming a cook and a chef. 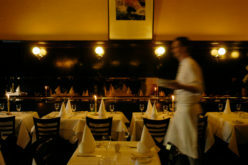 Then he moved to the front-of-house, working as a busboy, server, bartender and general manager. Meanwhile, Mendoza’s wife, Amelia, started working as a server at La Palmera in Everett. Because of her employment at the restaurant, the owners learned of her husband and asked him to work there. After 11 years of learning all aspects of the restaurant business, and soon after coming to La Palmera, Mendoza was invited to become a partner, eventually becoming the majority owner of the restaurant. Under his helm, the restaurant built up a loyal customer base, ultimately opening a second restaurant in Mill Creek. Customers are attracted to the authenticity of La Palmera’s food – much of which is based on recipes from Mendoza’s home town in Mexico. His cocktails, too, are authentic. Recently, in search of the perfect tequila, he traveled back to his native state of Jalisco, where tequila originated. While there, he personally hand-selected barrels of tequila made uniquely, bottled and branded exclusively for La Palmera. This spirit will be available at the restaurant soon. Thirty percent of La Palmera’s employees are members of Mendoza’s family. Many of the other employees have been working with the restaurant anywhere from five to 20 years. “They are like family members, they have been with us so long,” Mendoza said of his long-term employees. Mendoza also views his larger community as an extension of his family, and he puts great effort into supporting schools, churches and nonprofits through fundraisers. Among the beneficiaries of La Palmera’s generosity are Picnic Point Elementary School, near Edmonds; Glacier Peak High School, in Snohomish; Henry M. Jackson High School, in Everett; St. Mary Magdalen Parish & St. John Mission, in Everett; and St. Elizabeth Ann Seton Catholic Church, in Bothell. “La Palmera does a phenomenal job and is extremely generous to the parish,” said Shannon Everist, parish administrator at St. Elizabeth Ann Seton. This month La Palmera’s community will expand to Seattle with a new location in the South Lake Union neighborhood. Mendoza is planning on a March 30 opening date.